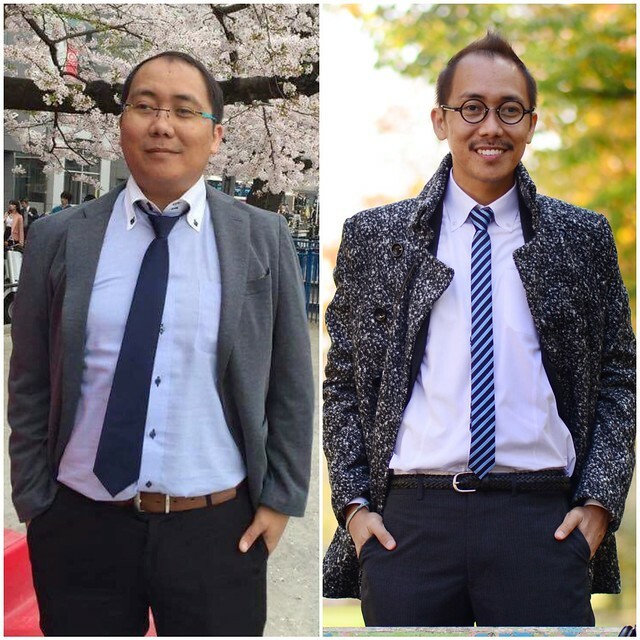 Last December, I posted my first “before and after” photo on Facebook. That was three months after I started my low-carb diet. Since then, I have posted 4 more times to show the progress. Don’t worry, this is the last “before and after” photo since I already reached my goal. I will just try to maintain it. why not blue or green? There are distractions along the way, but if you are determined enough, you can easily ignore them. Just focus on reaching your goal. Set your diet and target. If low-carb, then go low-carb. Never post Day 1 of diet / gym status. Post any improvement after 3 months or so. Check your weight every day to track your progress. Don’t skip breakfast. It will start your day right. Wash the dishes right away. It's therapeutic. Don’t allow yourself to go hungry. Almonds can save the day. Forget about soda. Try some vegetable juice, and protein shake. Prepare / cook your own food. It's fun preparing vegetable salad. Go to the gym. Do sports. Exercise. Jog. Sleep. Shower. Tell your friends to SHUT UP if they ask you to eat cakes, sweets, carbs. Just kidding of course. You can cheat too, you know. Most importantly ENJOY YOUR DIET. Do it for yourself. I received some positive feedback from colleagues and friends. And it felt good to know that I was able to inspire some of my friends and relatives. A couple of them are into low-carb diet already. Have a healthy 2017 everyone! Good to see you back Totomai - and looking very healthy! Well I am sure the snowman will say you have melted away. Looks as though you may have had buy a lot more clothes for the new look! Your poetry is the child of photography--it shows colors, shapes, feelings... so well. I watched the watching looking at himself in the mirror, I saw him change... and smile... under the changing sky. Ah, you really achieved your goal. Congratulations to you on setting one and following through. I do like the way you expressed melting in front of the mirror. Nice to see one's size diminish & also to get rid of those headaches! Have a happy holiday, Totomai; and see you in the new year. Totomai, you are an inspiration and you look fabulous and likely feel wonderful too. I am happy to know you are going home to visit your family.......enjoy your visit. Thank you for your gorgeous photos and the experiences you shared with us during 2016. Looking forward to more in 2017. Under other circumstances (not for weight loss), watching yourself melt away in the mirror would be alarming! Congrats on your weight loss! I can certainly relate to mothers being the bane of well laid weight loss plans. I like how your poem contrasted different changes so vividly, though it seems that last and most personal of changes seems to be the one that is the most bewildering and raises the most questions. A lovely, eloquent poem AND a very interesting post. Well done: YOU! Thanks Carob. It was fun having this transformation. ...love that! And congratulations on achieveing your weight goals... a healthy happy new year to you. Thank you for the diet tips. You look great and happy! You look great! Nice that you are so dedicated to your health. You inspire me to be more serious about maintaining good weight. Love your poem. Winter has its charms but sometimes makes us miss summer. Have a Happy Holiday season! Thanks Susan :-) Have a great holiday! Right diet pill or diet suppressant consumption at the correct time can result in effective shedding away of pounds from the body.